The first riding day of the trip started with breakfast at the Outlaw. Montana is known as “Big Sky” country, but our first impression was of big pancakes. These things were enormous; fully dinner-plate sized, with the thickness and consistency of a sponge cake. The waitress refused to let me order the “Two Pancakes” breakfast, fortunately as it turned out, since I didn’t manage to finish even the one. It certainly wasn’t the best pancake I’d ever had, but I’d be hard-pressed to think of a bigger one. It was a brisk but sunny morning. 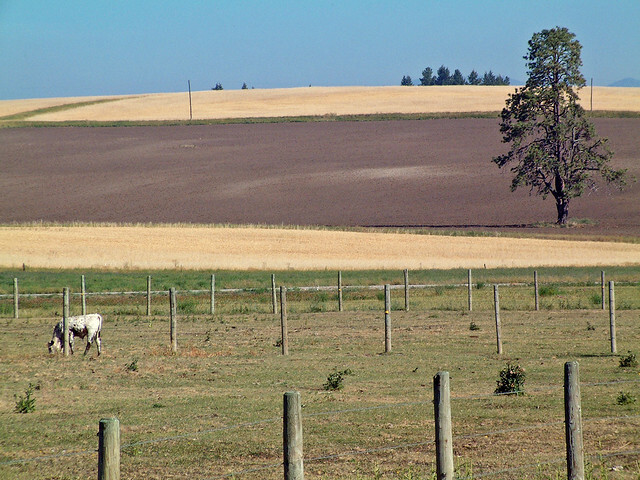 We headed north out of Kalispell on residential streets, making a stop along the way for food supplies for the riders and the van, then hooking up with Whitefish Stage Road, a quiet, rolling route through farm and pastureland. After cresting a small hill, I stopped to peel off a layer and to take pictures of the cattle, and most of the group wound up stopping at the same place. A pecking order was developing: Paul turned out to be a pretty strong rider, but our amazing grandma Nancy wasn’t far off his pace. Mark was strong but spent most of the time riding with his wife Suzanne, who didn’t have particularly strong legs but impressed us all with her strong resolve and great attitude. Nola and Julie alternated riding and driving the van, and tended to hang towards the back of the pack to help with rider problems. Partially because I was in good shape, but mostly because I was the only participant under 50, I was able to choose where I’d ride. The first pit stop was at the intersection of Whitefish Stage Road and US 40. Julie had the van set up with bananas, crackers, gorp, Oreos, and all sorts of other goodies. We had our first indication that Mark would be mechanically cursed throughout the trip, when he rolled up to the van with a flat tire. Most of us hung around while it got fixed; Paul and Nancy went off the front onto US 40. I pushed off after them while the rest of the gang was still dealing with it. US 40 was where I saw my first highway crosses. For many years, Montana didn’t have any speed limits, instead attempting to control drivers by erecting white crosses on curves where drivers had died. (The large number of these we saw on the trip testified to the ultimate failure of the idea). US 40 was a busy and utilitarian road, with a heavy stream of high-speed traffic. I slipped into commute mode, and cranked a little to try to catch up to Paul and Nancy. I think they stopped off at a market to use a more civilized restroom facility than the one most of us had used back at the junction, because somehow I wound up ahead of them without passing them on the road. I found out I was ahead when they passed me after I pulled over to adjust the cleats on my new shoes. 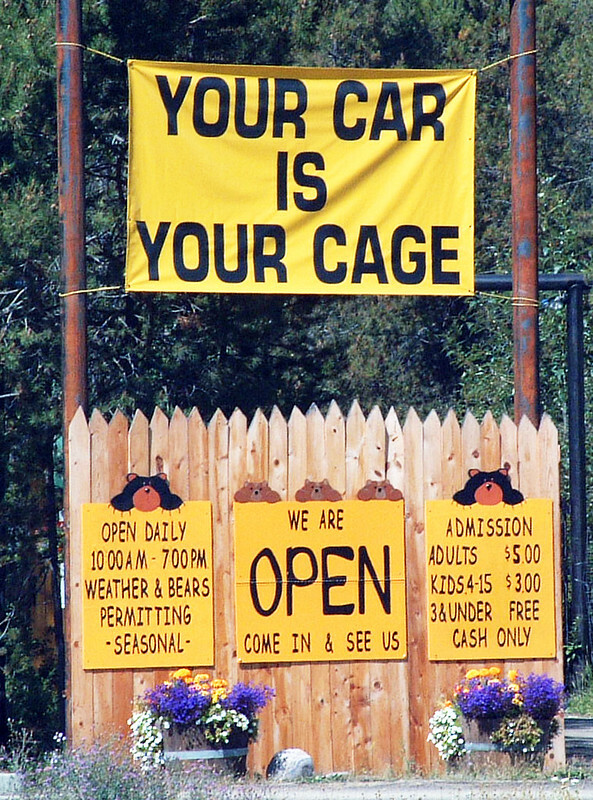 I also stopped for photos at several points along the route, notably at the Great Bear Adventure, where YOUR CAR IS YOUR CAGE. (I couldn’t agree more). As we moved from US 40 onto US 2, we encountered a few areas with particularly annoying traffic, where the road narrowed without the traffic lessening. This motivated me to keep my pace up through Hungry Horse and until I made the left turn into West Glacier, the entrance to Glacier Park itself. I met the van in West Glacier, and hooked up with Mark and Suzanne for the short ride into Apgar. On a footpath through the woods, I had my first mechanical problem of the trip—my front derailleur cable frayed and worked its way out of the cable clamp, throwing me onto the granny ring. The path was flat, so I just rode that way until we got into town. I was able to clamp what was left of the cable when we got to Apgar. We had to hang out at Apgar for a few hours, due to the restrictions on bike travel on the Going to the Sun Road. The National Park Service believes that car drivers should be encouraged to defile the most pristine and beautiful areas in the country, while people behaving in an ecologically responsible manner should be marginalized. In Glacier Park, this means bikes can’t ride the Going to the Sun Road from 11:00 AM to 5:00 PM. Apgar’s not a bad place to spend some time—this policy wouldn’t truly annoy us until the next morning. After jiggering my front derailleur, I joined Paul in a kayak on Lake McDonald. 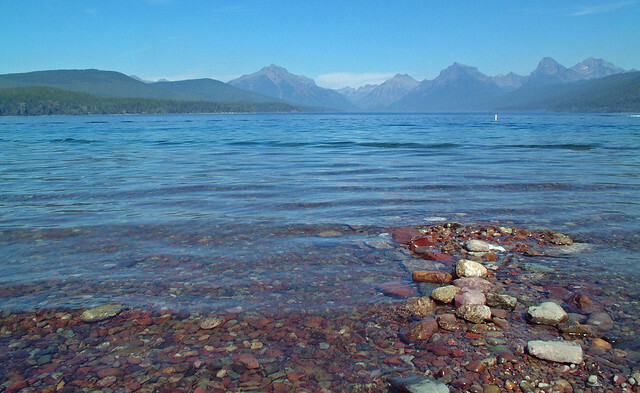 Lake McDonald reminded me of Tahoe—the deep, clear water and the encircling peaks made for a beautiful setting. We stopped by the Glacier Park visitor’s center, where there’s a detailed topographic map of the park. Nola and Julie showed us the route we’d be taking over the next few days, and I picked up a map which included directions to the Head-Smashed-In Buffalo Jump. You may have heard about this place. The Native Americans would sometimes hunt for buffalo by trying to stampede them off a cliff. One particularly bright native decided he wanted to watch the hunt from the bottom of the cliff, and the rest, due to the typically literal and direct manner Native Americans have for naming places, is history. After 5PM, we rode the 10 kilometers to Lake McDonald Lodge, where we were staying for the night. We headed out in our normal pecking order, with me and Paul riding together, Nancy behind us, and Mark and Suzanne bringing up the rear. But then Mark decided he wanted to get some pictures of Suzanne coming up the road, so he hammered for a little while, caught up with and passed us briefly. Paul and I initiated pursuit, and the three of us set up a paceline for a couple of klicks. Mark peeled off to take pictures (so he said), but Paul and I kept hammering up the road. This was when I found out that Paul is a tri-athlete, and is a swimmer before he’s a bicyclist. From his swimming, he’s picked up the habit of forcefully exhaling when he’s working hard. I’d be taking a pull, and hearing him panting behind me, I’d slack off thinking he was about to drop off. Then suddenly he’d come around and take a pull himself. It took me a while to get used to the unusual feedback, but eventually we got into a pretty good rhythm. Since the testosterone was flowing, I felt it necessary to out-sprint him to the lodge when it appeared on our left, but he rolled in right behind me, and the rest of the gang came in about 10 minutes later. Our tour plan had us staying in a series of old railroad lodges, now run by Glacier Park, Inc. Lake McDonald Lodge was the first of these, and like all of them, it was a destination in itself, the kind of hotel they don’t build anymore. We ate at the lodge restaurant (I had the ravioli, and a brownie sundae), and when “El Paso” came on the sound system I was chided by the more, ah, experienced, members of the group for identifying it as a Grateful Dead song. Afterwards I went out to the stony beach to take some photos. It turned out to be more difficult than I expected to get good shots, mostly due to the presence of a large number of annoying children who had not yet developed a method of interacting with nature more sophisticated than throwing rocks at it. After dark I attended a ranger talk about the incredible range of wildlife to be found in the park, then retired to my room to rest up for the big day tomorrow.